The Cardiac Catheterization Equipment Performance Task Group was formed to provide a reference document that discusses equipment features, physics Quality Control test procedures, and radiation dose issues associated with this equipment. Because Cardiac Catheterization Laboratories are very specialized facilities dealing with different clinical imaging issues outside the realm of normal radiology imaging systems, many medical physicists have only limited experience evaluating the performance of this equipment. The patient and scattered radiation doses in these rooms are among the highest delivered by any application of diagnostic imaging equipment in medicine. The equipment tends to be complex with many different types of feedback control loops. Because of the tiny vessels in the heart into which catheters are placed, the clinical demands require the equipment to have superb image quality for dynamic studies of cardiac function in critically ill patients. Furthermore, there are few literature sources that gather this type of information in a single reference publication that can be readily utilized by the medical physicist. The only previous AAPM Report of similar nature is No. 12, “Evaluation of Radiation Exposure Levels in Cine Cardiac Catheterization Laboratories,” which was issued in 1984. 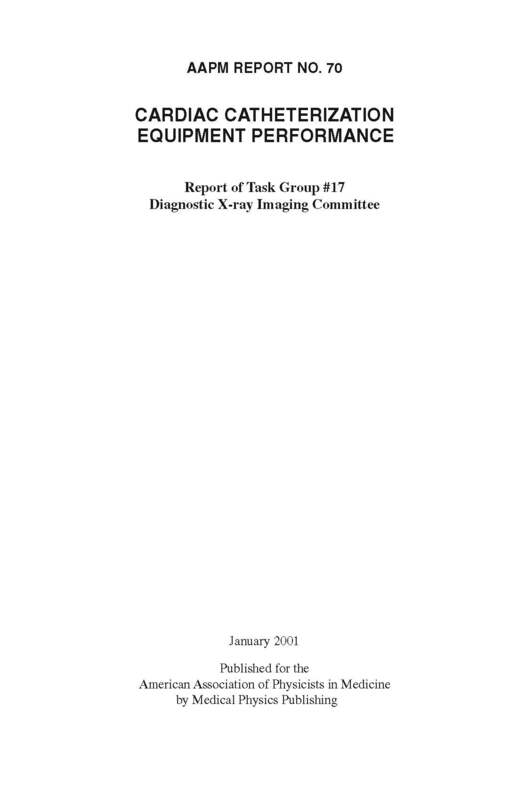 This publication addressed only the radiation dose levels; it did not discuss the equipment or the physics testing procedures. Moreover, there have been significant changes in the technology that affect both the equipment performance and the radiation doses. For these reasons, this Task Group was formed to provide a source of information for those physicists who have responsibilities associated with the performance and radiation safety in Cardiac Catheterization Laboratories. The Task Group members hope that the information contained in the document will be valuable to the readers.